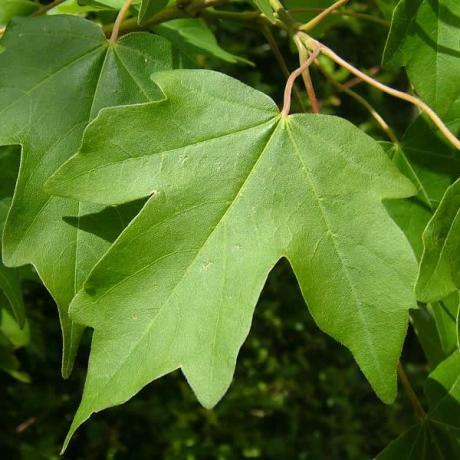 Field Maple is often found in hedgerows. The leaves are five-lobed and dark green turned orange-yellow in the autumn. Flowers are yellow-green in colour. Suitable for shaded areas. 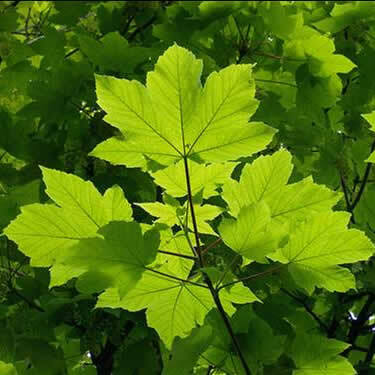 Norway Maple is a deciduous tree growing to 20-30 m tall with a trunk up to 1.5m diameter, and a broad, rounded crown. The autumn colour is usually yellow, occasionally orange-red. Sycamore is a large deciduous tree that reaches 20–35 m tall at maturity, with a broad, domed crown It is noted for its tolerance of wind, urban pollution and salt spray, which makes it a popular tree for planting in cities, along roads treated with salt in winter, and in coastal localities. 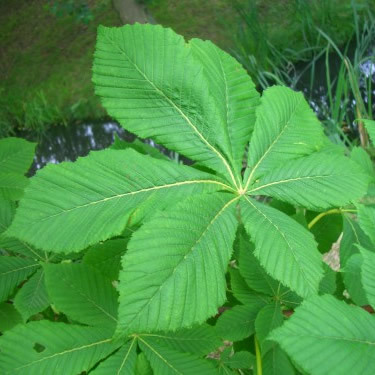 Horse Chestnut are often planted as ornamental trees along avenues. Grows pyramids of white flowers that cover the tree in late spring/early summer. 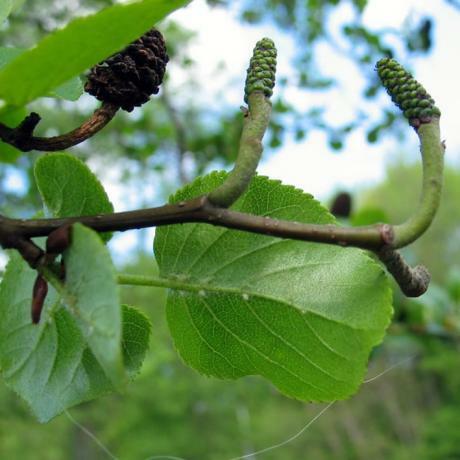 Italian Alder is a pretty, fast growing egg shaped tree, often used as windbreak. Any soil will do, although it prefers heavier loams and wet clay. Italian Alder is happy in both acid and alkaline ground. Common in wet ground, marshes and stream-sides. Rounded leaves are light green. Flowers green catkins (Feb – March) that become black when ripened a year later. Fast growing. Grows to max of 20m Timber uses include woodturning and charcoal. 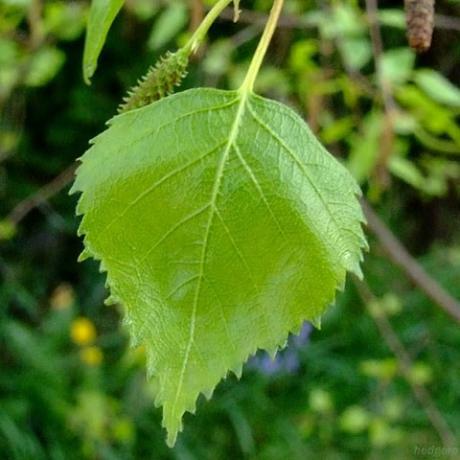 Silver Birch has a silver-grey bark, oval leaves with pointed tip that turn yellow in autumn. Fast growing grows to 20-25m. 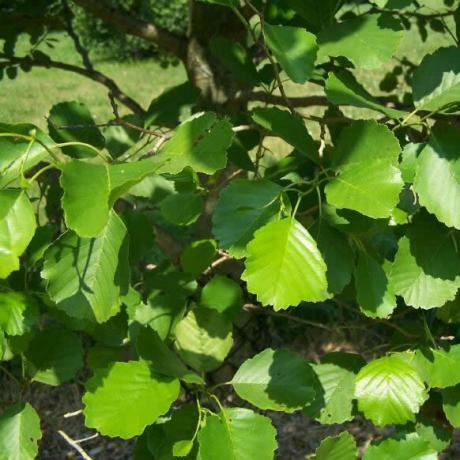 Silver Birch found mainly on dry, sandy soils. Common in damp areas. Young branches are bigger than silver birch and have grey bark often covered with lichen and moss. Slower growing than silver birch. 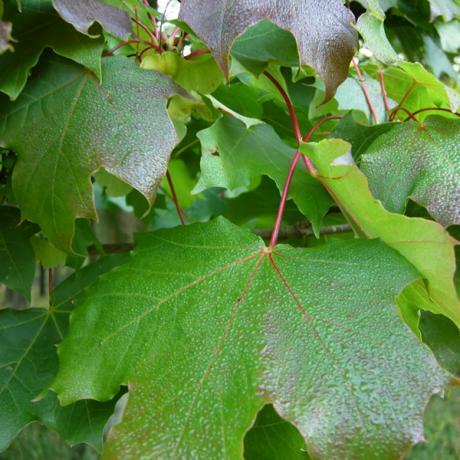 The leaves are oval with a pointed tip and finely serrated margin Grows to 15-20m. 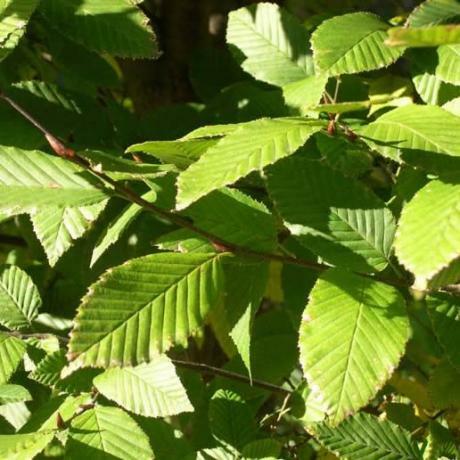 Grown naturally, Hornbeam is a medium sized native tree that makes a beautiful parkland specimen. but it is most widely used for hedges. 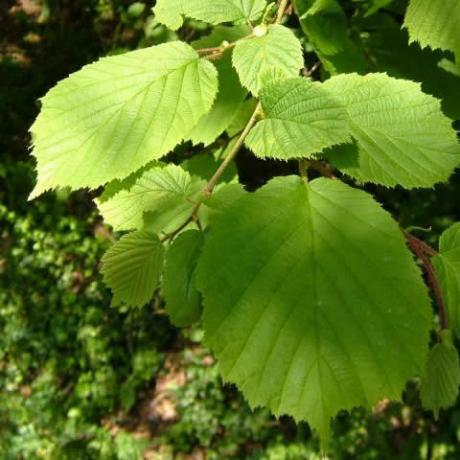 Its ability to grow in wet places (where beech absolutely will not) makes Hornbeam a most useful tree for poor planting conditions. 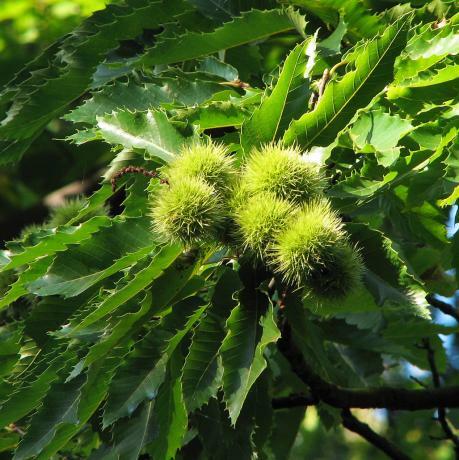 Spanish Chestnut is a medium-sized to large deciduous tree attaining a height of 20-35 m with a trunk often 2m in diameter. The leaves are long ovals with toothed margin. 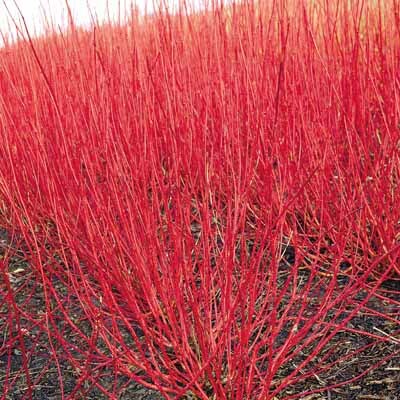 Red Dogwood is a distinctive shrub with red stems and white fruit that will grow in any soil, particularly the damper ones. It is commonly used as a screen but can also be used as a specimen shrub. 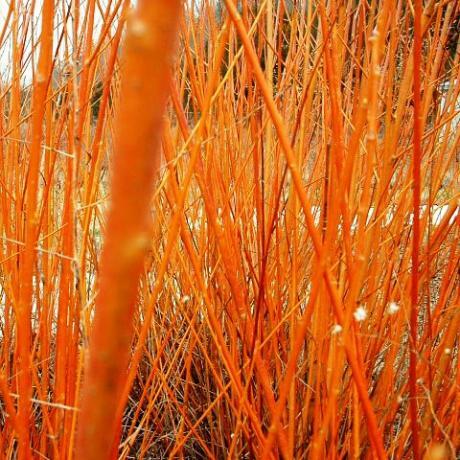 The Yellow Twig Dogwood tolerates wet soils and can be grown in full sun or part shade. Deep red leaf colours in Autumn followed by yellow bare stems in winter provide year round interest. A small tree or shrub. 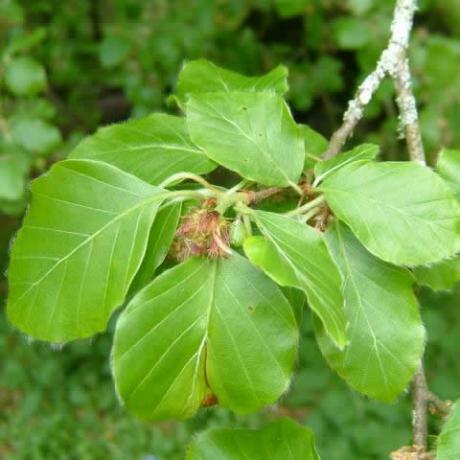 Hazel is commonly found in hedgerows or as part of the understory in oak and Ash Woodland. The nuts are much sought after food source for wildlife. Whitethorn our most common hedgerow plant. It puts on a stunning display of white flowers in spring and red berries in Autumn. Is also suited to forming stock proof hedges. This hedgerow and woodland shrub is quite common. 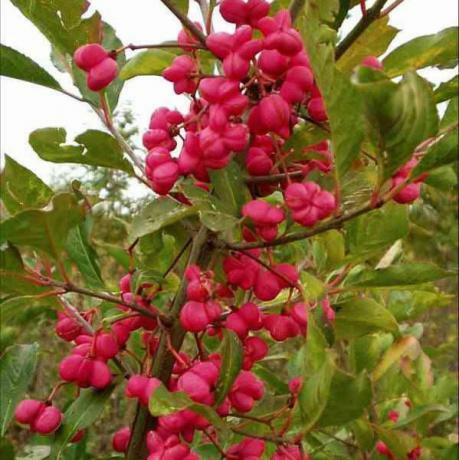 Although inconspicuous for much of the year it has a stunning autumn display of orangey leaves and bright pink berries. Beech is a large tree that can grow to 40m in height. Oval leaf with wavy edge. Very well suited to forming a hedge and although deciduous the hedge will hold the brown leaves over the winter. Not suited to heavy damp soils. 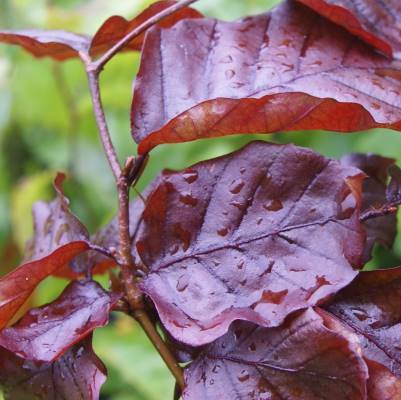 Copper Beech is a variety of European beech with shining purple or copper-colour leaves. Again suited to forming a hedge and not suited to damp heavy grounds. 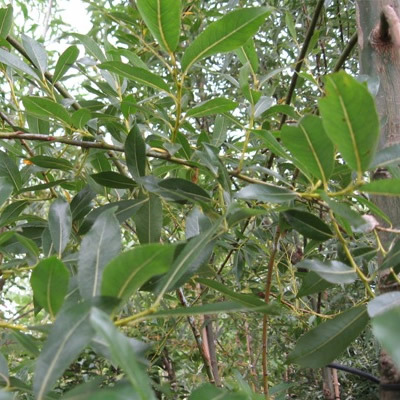 It is one of the few native broadleaf evergreen trees. 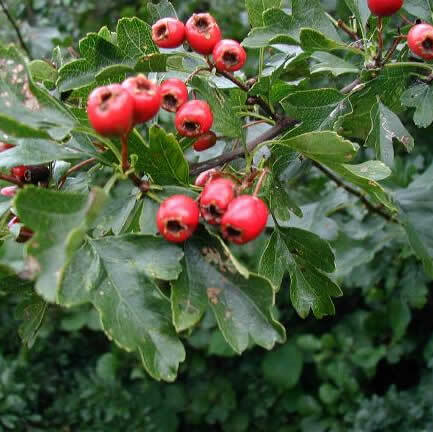 Holly is very suitable for gardens as a specimen tree or hedge. 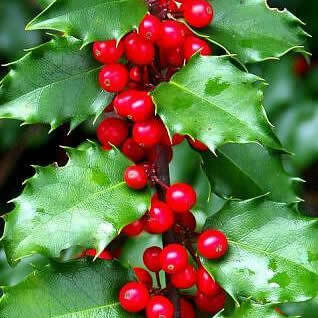 Holly trees are either male or female so it is worth planting a few together as only the females produce berries. 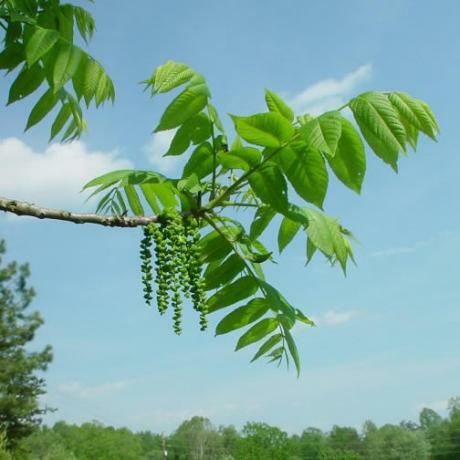 The black walnut is a large deciduous tree attaining heights of 10-15m. Black walnut is highly prized for its dark-coloured true heartwood. It is heavy and strong, yet easily split and worked. 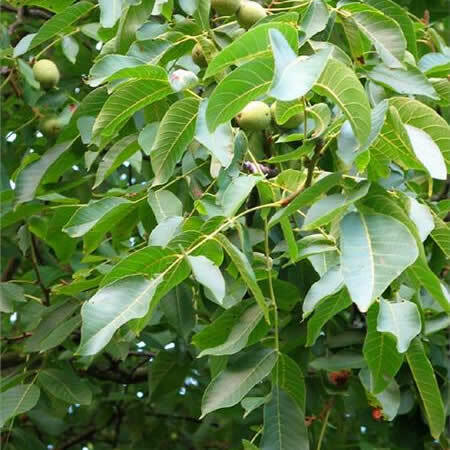 Common Walnut is a large deciduous tree attaining heights of 25–35 m, and a trunk up to 2m diameter, commonly with a short trunk and broad crown, though taller and narrower in dense forest competition. It is a light-demanding species, requiring full sun to grow well. 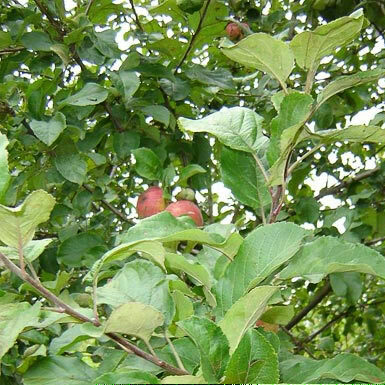 Common Crab Apple is a small tree, which produces pinkish-white flowers, it is ideally suited for gardens as a hedgerow or individual tree. Birds and insects appreciate the heavy crops of fruit. 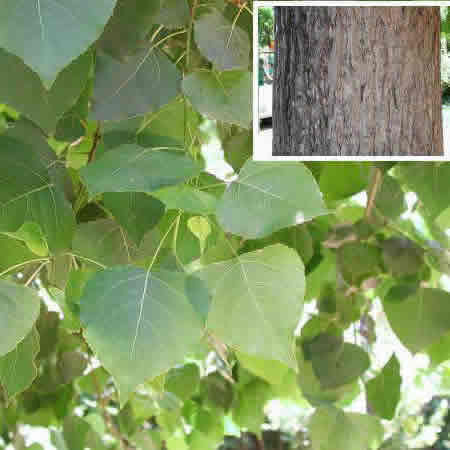 White Poplar is a species of poplar, most closely related to aspen. It grows well in moist sites, often by watersides. 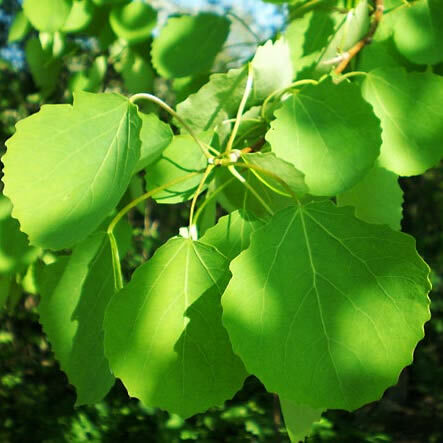 It is a medium-sized deciduous tree, growing to heights of up to 16-27 m (rarely more), with a trunk up to 1 m diameter and a broad rounded crown. The bark is smooth and greenish-white to greyish-white. The young shoots are covered with whitish-grey down, including the small buds. There are a variety of clones available, selected for their quality. Most hybrids grow very fast but often lack the cold and drought hardiness of the native poplars. The true Lombardy poplar, selected in Lombardy, northern Italy, in the 17th century. The growth is fastigiated, with a very narrow crown. Coming from the Mediterranean region, it is adapted to hot, dry summers and grows poorly in humid conditions. 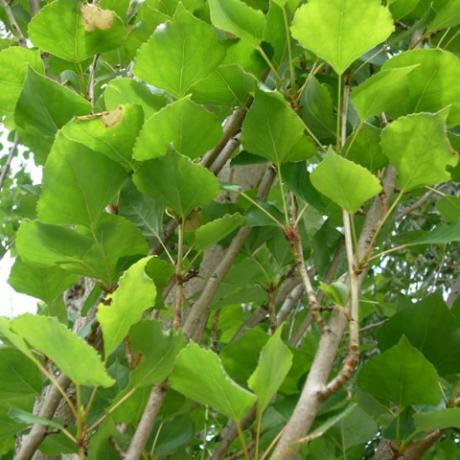 Robusta Poplar is a fast growing, wind tolerant deciduous tree with straight trunk to summit. 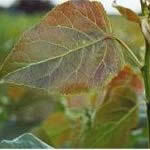 Grows 25-30m .Young leaves coppery-red turning to glossy bright green then yellow in autumn. Good screening tree. Any ordinary soil, except badly drained. Aspen is an uncommon tree found mainly growing in wet areas. It suckers very readily and may take over areas in ideal conditions so be careful. The leaves appear to tremble when the wind blows (hence the name). 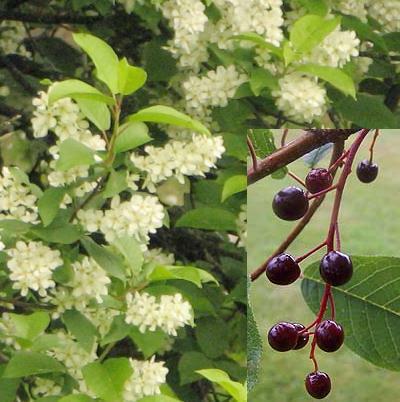 Prunus Avium, our common cherry, also known as wild cherry, The 5-petalled white blossoms are long-lasting throughout April and May, followed by the fruits in July. Unhampered by surrounding growth and planted in fertile, moist soil, this deciduous, open-branched tree grows quickly to 15 metres tall, often reaching up to 25m tall. 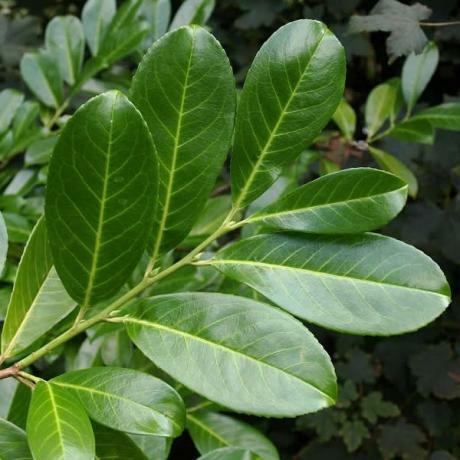 Laurel is a very dense, fast growing, evergreen hedge with large, leathery, glossy green leaves. In spring, upright spikes of white flowers contrast well against the foliage. This variety will form a tall, wide, substantial hedge. Shade tolerant. 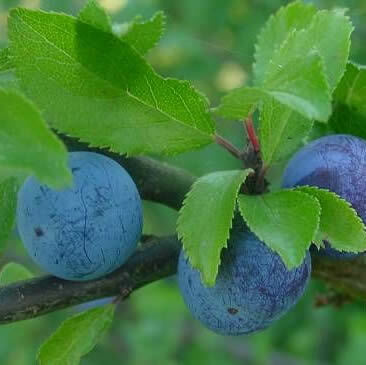 Blackthorn is a shrub with long sharp thorns often found in hedgerows. It stands out iin early spring with masses of white flowers which appear before the leaves. It grows in a wide variety of soils with the exception of very wet conditions. Sessile Oak is a large, slow growing, native, deciduous tree. 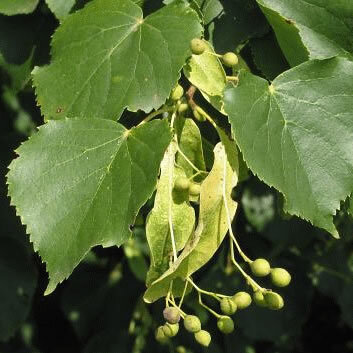 Spreading habit, with ridged grey bark and yellow stemmed, dark green, large glossy leaves. Stubby acorns with no stalks appear in autumn. 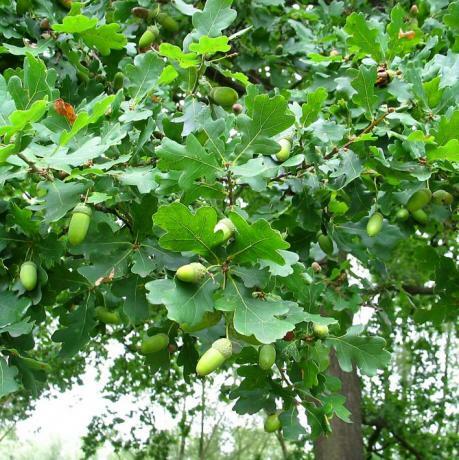 Common Oak is a hardy, slow growing tree, eventually forming a large round-headed native deciduous tree with acorns on long stems in autumn. Good in hedgerows as it usually produces tap roots in early life, so it does not rob the surrounding plants of moisture and nutrients. Although it produces a broad crown, it does not prevent the hedge from growing well in its shade. Will become home to a copious number of insects and species of wildlife. Very long-lived, up to 200 years. Any ordinary well drained soil, tolerant of clay, produces best quality timber on heavy soil. 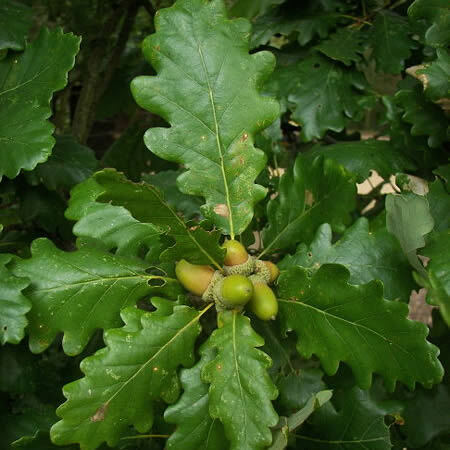 Oak is a common tree in Irish woodlands. Can grow to 40 meters. 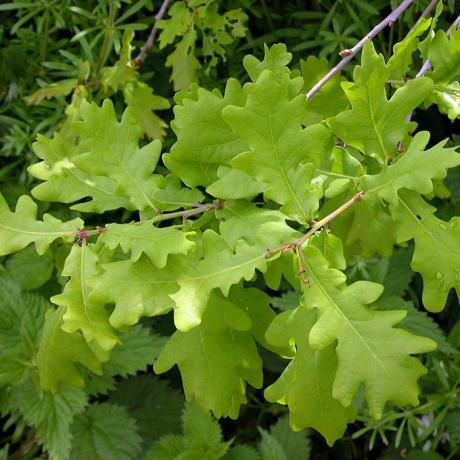 Leaves are lobed and shorter than those of sessile oak. Acorns are a valuable source of food for wildlife habitats. Produces long lasted durable wood used for furniture. 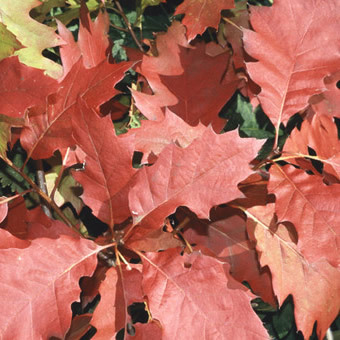 Red Oak is native of North America. Straight, tall trees that grow rapidly and are tolerant of a wide range of soil types. Provides beautiful autumn display of vibrant colour. 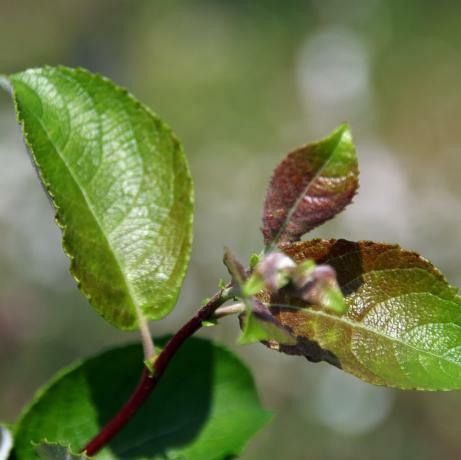 Scarlett Willow is a large native deciduous shrub or small tree with long, broad leaves, grey-green above and intense grey on underside, with contrasting red veins. Abundant yellow catkins appear in spring on the stout, bare, pubescent orange/scarlett branches, giving a splendid display. Any soil but thrives in wet areas. Eared Willow is considered to be a shrub, rather than a tree, and it can reach 3 metres in height with stems up to 20 cm. in diameter. It is typically rounded and bushy in shape, with multiple stems spreading out at, or near, ground level. The most distinctive feature is the \’ears\’ or stipules which give the species its common name. These are small leafy appendages that are somewhat ear-like in shape, and grow on each side of the leaf stem. 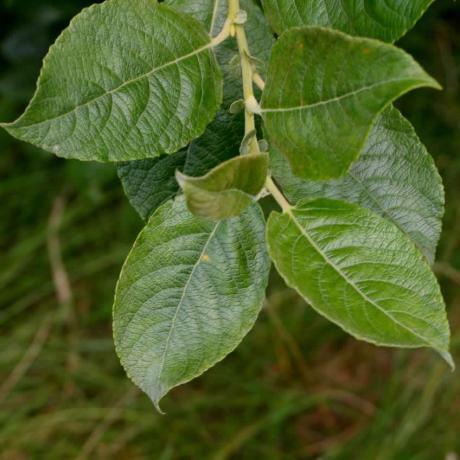 Goat Willow is a shrub-like, native, deciduous tree with greyish leaves and large showy golden male and silver female catkins in late March which appear before the leaves. Catkins are attractive to bees as few other flowers are out. Any soil but thrives in moist soils. Grey Sallow is a large deciduous shrub or small tree with long, broad leaves, grey-green above and intense grey on underside, with contrasting red veins. Abundant yellow catkins appear in spring on the stout, bare, pubescent grey-green branches, giving a splendid display. Any soil but thrives in wet areas. 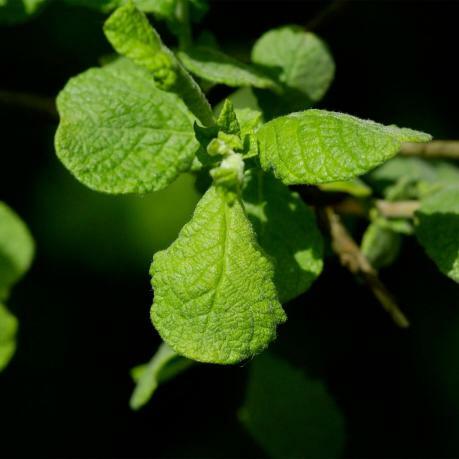 Violet Willow is a small to medium sized, fast growing deciduous waterside tree that produces amazing violet shoots in winter carrying fluffy catkins in spring. 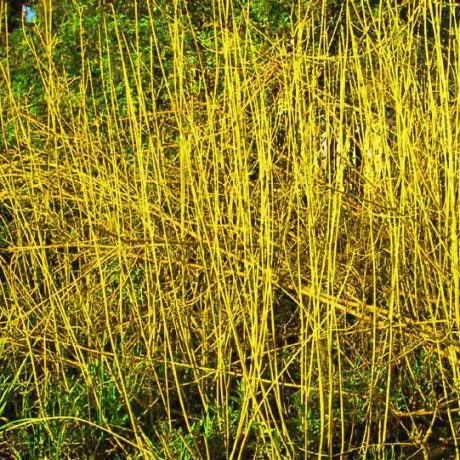 The Violet Willow is an excellent choice for coppicing. Cut back very hard every 2 years for best effect. Any soil, ideally damp, can grow to 5m. Common Osier a large native, deciduous shrub or small tree with young shoots covered with soft grey downy hairs. Catkins appear in spring before the long tapering leaves which are covered underneath with silky hairs. Pliant stems, known as withies, are used extensively in basketry. Rowan is a small deciduous tree. 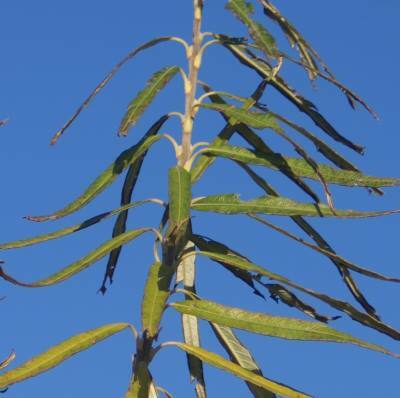 Leaves are divided into 5-10 leaflets; they are long and narrow in shape. Common in upland and waterlogged areas. Bountiful display of red berries in the autumn perfect for wildlife. 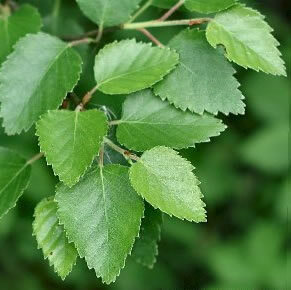 White Beam is a very tough, round-headed deciduous native tree with leaves bright green above and downy white beneath. 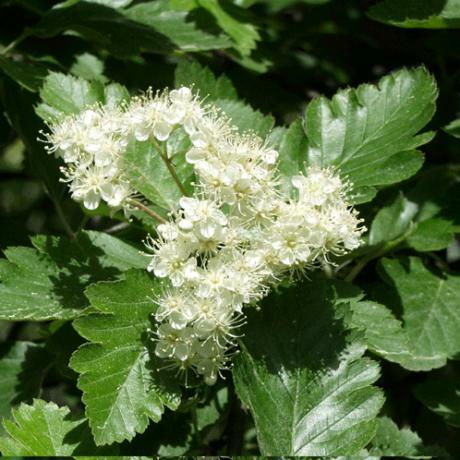 Flat bunches of white flowers May to June followed by dark red fruits in autumn. Any ordinary well drained soil, sun or partial shade. Salt tolerant. Lime is a large deciduous tree that can grow 25-30 meters tall. Small yellow-green flowers are produced in early summer. It’s Flowers are a favourite with bees. 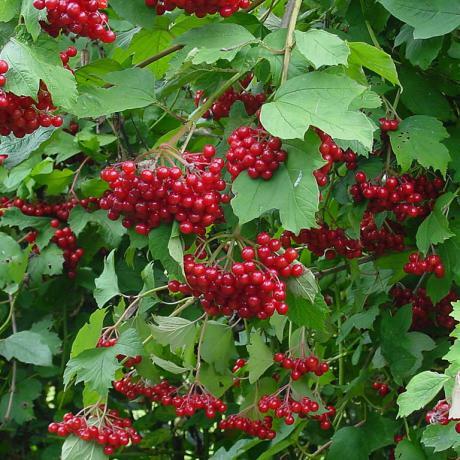 Guelder Rose is a highly attractive native shrub found in hedgerows and woodlands. 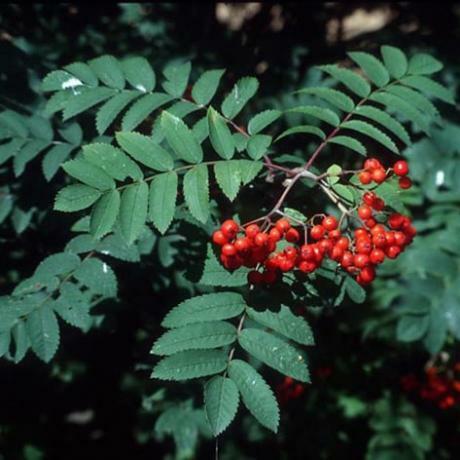 White flowers are followed by red berries in the autumn. The foliage turns various shades of red and orange to add to the stunning autumn display.